I like to spend Quality Time working on riders Snowboard Tricks Base every season, with all levels of riders that I coach. This involves utilizing a set of drills that will allow us to check our strengths and weaknesses in terms of board control and comfort level with different types of rotational take offs and landings. Below you will find 2 sets of Snowboard Tricks Base drills that I find invaluable in finding and practicing movements to isolate strengths and weaknesses in a riders snowboard tricks base. The idea behind these drills is to practice every type of take off and landing you will ever encounter. In both the traversing and turning version of the exercise we will use flexion extension in the knees and body to load and wind up, then pop and unwind with a snap to do a little 180, land and reload, wind up and pop into the next 180. The movement of the lower body is vital to provide the jumping motion that will provide enough airtime to get the 180s around. The movement of the upper body is very important to provide the rotational wind up, snap and follow through to execute the 180s. The traversing 180s drill is an awesome snowboard tricks base exercise. It requires a wide groomed run with a medium pitch and little bumps to pop off of can make it easier. Really be careful about traffic, as you and anyone your training will be cutting straight across the hill. Try and pick a time and place where traffic is minimal. Goofy or Regular doesn’t really matter; you will both hit every edge and every take off and landing of your snowboard tricks base. To the Right, Frontside 180s – First off, we will start motionless on the left side of the trail. Whether you start moving on the heel or toe, you will get a little speed across the hill going then crouch, wind up for a frontside rotation, pop and unwind, spin it, land it and right away reset to crouch, wind up and snap a frontside 180 the other way. The whole time traversing from left to right and looking in the direction you’re going across the hill. Try to get 4 or more 180s in the one left to right traverse. Now, stop and think about the next traverse. To the Left, Frontside 180s – This time from the right side of the trail. Since you’re going the other way now, you will be taking off and landing on opposite edges than you were on the last traverse. Whether you start moving on the heel or toe, you will get a little speed across the hill going then crouch, wind up for a frontside rotation, pop and unwind, spin it, land it and right away reset to crouch, wind up and snap a frontside 180 the other way. The whole time traversing from right to left and looking in the direction you’re going across the hill. Try to get 4 or more 180s in this right to left traverse. Now, stop and think about the next traverse. To the Right, Backside 180s – Now for the Backsides, again we will start motionless on the left side of the trail. Whether you start moving on the heel or toe, you will get a little speed across the hill going then crouch, wind up for a backside rotation, pop and unwind, spin it, land it and right away reset to crouch, wind up and snap another backside 180 the other way. This time for every 180, you will look away from the direction of travel and be blind during the rotation. The whole time traversing from left to right across the hill. Try to get 4 or more 180s in the one left to right traverse. Now, stop and think about the next traverse. To the Left, Backside 180s – This time from the right side of the trail. Since you’re going the other way now, you will be taking off and landing on opposite edges than you were on the last traverse. Whether you start moving on the heel or toe, you will get a little speed across the hill going then crouch, wind up for a backside rotation, pop and unwind, spin it, land it and right away reset to crouch, wind up and snap another backside 180 the other way. This time for every 180, you will look away from the direction of travel and be blind during the rotation. The whole time traversing from right to left across the hill. Try to get 4 or more 180s in this right to left traverse. Moving onto the Turning with 180s portion of building your snowboard tricks base. This is the same idea as the traverses, only this time you will be doing the 180s between turns down the hill. This can be done on a flatter run since you can use more fall-line than the traverse drill. Part of this drill is looking for tiny little bumps on the groomed run to pop off of. Okay, let’s do it. Toe Edge Turns, Frontside 180s – First let’s start by doing a forward riding Toe Edge turn, as you approach the end of the turn crouch, wind up for a frontside rotation, then pop and unwind into a frontside 180, that you will land on a new toe edge turn, now riding switch. As soon as your stable in that new turn, crouch and wind up the other way to pop into another frontside 180 (half cab) back the other way, again trying to land on a new toe edge turn. In this drill you should rotate just a little more than 180 due to the effort to take off and land in a turn. The turn should not be sharp. Just a nice medium sized turn will do. Heel Edge Turns, Frontside 180s – This time we will start by doing a forward riding Heel Edge turn to begin. As you approach the end of the turn crouch, wind up for a frontside rotation, then pop and unwind into a frontside 180, that you will land on a new heel edge turn, now riding switch. As soon as your stable in that new turn, crouch and wind up the other way to pop into another frontside 180 (half cab) back the other way, again trying to land on a new heel edge turn. In this drill you should rotate just a little less than 180 due to the effort to take off and land in a turn. Toe Edge Turns, Backside 180s – Now, back to backside. Again, start by doing a forward riding Toe Edge turn, as you approach the end of the turn crouch, wind up for a backside rotation, then pop and unwind into a backside 180, that you will land on a new toe edge turn, now riding switch. As soon as you’re stable in that new turn, crouch and wind up the other way to pop into another backside 180 back the other way, again trying to land on a new toe edge turn. In this drill you should rotate just a little less than 180 due to the effort to take off and land in a turn. Heel Edge Turns, Backside 180s – Last and most challenging in the snowboard tricks base, heel edge turns with backside 180s. Start by doing a forward riding Heel Edge turn, as you approach the end of the turn crouch, wind up for a backside rotation, then pop and unwind into a backside 180, that you will land on a new heel edge turn, now riding switch. As soon as you’re stable in that new turn, crouch and wind up the other way to pop into another backside 180 back the other way, again trying to land on a new heel edge turn. In this drill you should rotate just a little more than 180 due to the effort to take off and land in a turn. You have just practiced every different possible take off and landing in your snowboard tricks base. For most people the hardest take off is switch backside, off of the heel edge. Think for a minute about the drill you have just done. Which take offs felt comfortable and which did not. Use it as a reference as to the types of tricks you might find easier and also which are uncomfortable or “Weird” feeling. I believe that Weird just means you need to do it more, to make it more comfortable and bring it out of the weird zone or at least to get used to the weird feeling. Practice these drills regularly and always demand perfection from yourself. 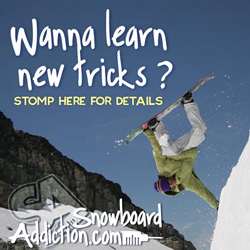 It will result in a stronger and more technically sound snowboard tricks base to enhance your progression efforts.